Robot maker iRobot announced its 2008 financial figures today, but more interestingly predicted that sales of military robots would soar in 2009. The cybernetic manufacturer revealed that its government and industrial business grew more than 50 per cent in the last quarter compared with the same period a year ago, taking its revenues for the year to over $305 million (£210 million). Domestic robots like the robo-cleaner Roomba 500 and the gutter-scouring Looj helped international sales double year-on-year, but it's in the military sector that iRobot predicts the greatest growth. iRobot has already been awarded $2 million (£1.4 million) by the US Congress to develop the Warrior 700: a powerful and rugged robot for use in danger zones and inaccessible areas. The Warrior 700 will perform a variety of critical missions, including providing real-time video, audio and sensor readings to combat troops and local law-enforcement SWAT teams. 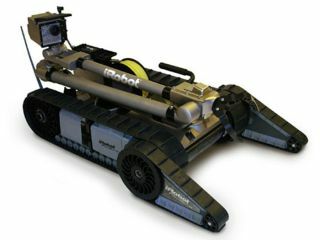 The robot features an advanced digital architecture and a multi-mission chassis that supports payloads of up to 68kg (roughly equivalent to a skinny adult or fat kid). The company expects more military sales in 2009, which should supplement the fall in US consumer sales as they slacken off due to the recession.